Figure 1. 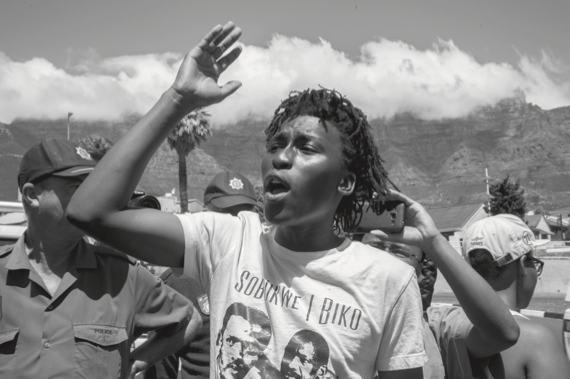 Masixole Mlandu, a University of Cape Town (UCT) student protest leader, during a national shutdown protest. Cape Town. 2015. In 1994, South Africa celebrated its first universal elections. The event marked the end of apartheid, the institutionalized system of racial segregation that characterized the country for almost 50 years. I was born in South Africa just one year prior to this historical event. As a consequence, I am a member of the “born-free” generation, the growing population of South African youth born into a free and racially undivided South Africa. Commonly referred to as “born frees,” South African youth born after the fall of apartheid make up almost 40 percent of the population. 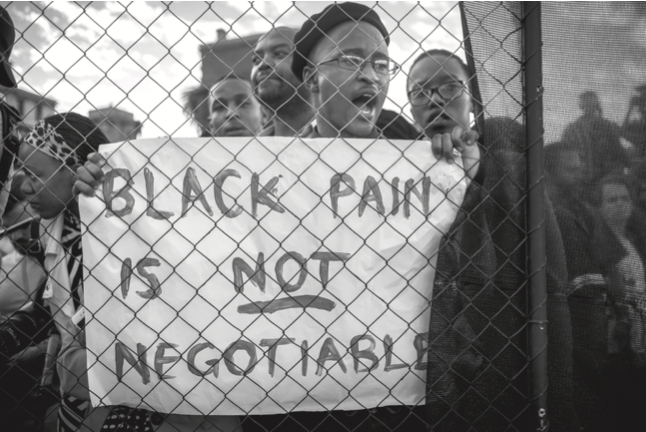 Critics among older South Africans contend that it is an apathetic, apolitical generation that is profoundly unaware of the history of struggle that made freedom and desegregation possible. 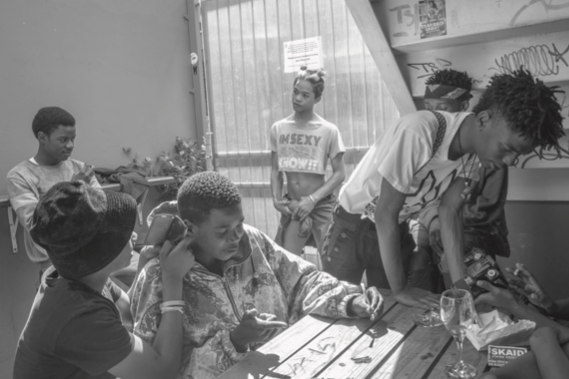 As a photographer who was also born free, I document everyday South African youth culture in an attempt to call into question preconceived ideas about what it means to be born in the wake of profound political and social change. 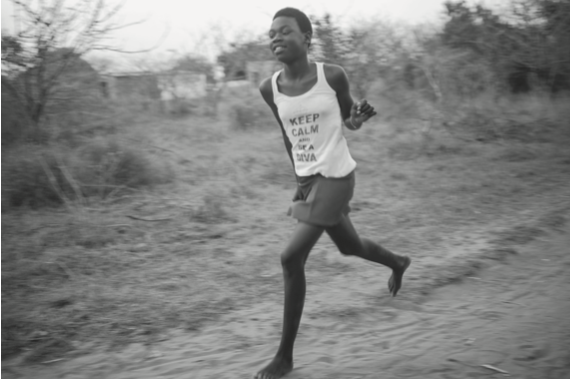 Approaching photography as a way to enter into different social worlds, I examine how South African youth imagine themselves. By documenting youth culture, I use images to try to understand whether newer generations define themselves in relation to the scars leftby apartheid or whether they embrace freedom, choice and opportunity. Figure 2. “How must we forgive?” An important Xhosa saying that re ects on the experiences of black people during apartheid and their lives in the postapartheid context. Gra ti at the University of Cape Town. 2015. In South Africa, a country marked by linguistic, cultural and racial diversity, the ideologies of freedom are not singular, but rather multiple. In my work, I reflect on what the category of “free” signifies. I believe that labeling all South African youth as born free creates much confusion. While most would agree that under apartheid, white children were more free than the majority of their black counterparts, it is not certain whether this new way of labeling younger generations implies that those born before the first democratic elections were not, in fact, free. It is important to ask whether new generations can be defined solely by this political term and whether the effects of segregation linger on in the lives of black children whose parents burned their dom-passes and exercised their right to vote for the first time in 1994. In this sense, were these children born free? Can this term also be used to refer to white children who call their black mates friends now that segregation rules no longer exist? My work analyzes these complex questions by documenting the apartheid system and examining how it affects the lives of South African youth who have different, complex backgrounds and life experiences. Through photography, I seek to understand what it is about the generations of South Africans born after 1994 that can be called free. Figure 3. A domestic employee working at the Inanda Club. Sandton. 2014. I grew up in one of the townships that I believe make South Africa what it is. As a child, I often reflected on my life and its surroundings. I thought that life was like a matchbox and that people were the matchsticks. The only way to get out of the township was to be dead, dead like a used matchstick. A lucky person might find the rare opportunity to escape. One could get transported to somewhere else, kind of like when a matchbox falls out of someone’s pocket. My experiences with township life made me want to create my own world, a futurist world where it would be safe for me to live. Photography became a therapeutic tool both for me and for those around me. With the camera, I could create new, safer worlds. I could invent spaces where there were no lies, where I knew exactly where I stood and what I could contribute to my community. My country is beautiful, but it is also filled with misconceptions and untruths. In disadvantaged communities like those that inhabit the townships, there are many myths and misconstructions about what South Africa is and is not. My journey as a photographer is about discovering the truth through uncomfortable conversations and encounters that can generate an exchange of knowledge. Figure 4. 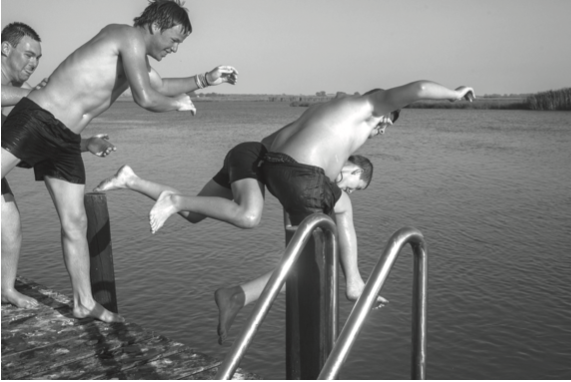 Young boys swimming in Veldrift. 2014. When I reflect on my childhood experiences, when I think about the environment where I grew up and the problems I faced, I find it hard to describe myself as free. 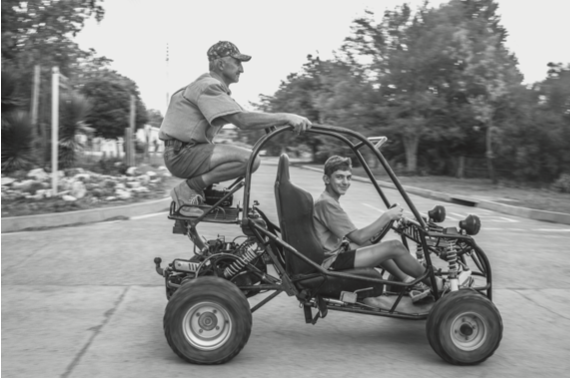 By documenting the everyday lives of my South African counterparts, I have been able to explore the very different definitions of freedom that exist in this country. I began to see that this label is a complex one not only for me, but also for others. 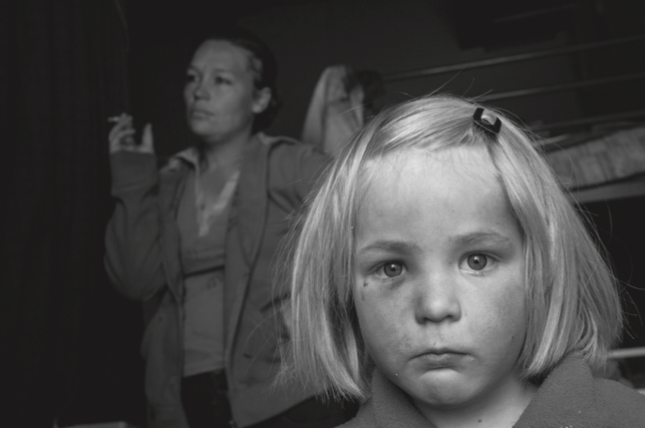 The camera has allowed me to examine a wide variety of social dynamics that structured communities that were unknown to me. More important, it has allowed me, a stranger, to enter into other social worlds where people my own age were also struggling to understand what it meant to be born free in contemporary South Africa. I have listened to my subjects narrate their life experiences, attentive to the environmental backgrounds, family problems and class “status” that had shaped their lives. I have allowed myself to see born frees through the same lens that allows me to interpret my own life. Through our exchanges, through moments of joy and sadness, I began to understand where I belonged in this complex society and what I could offer to other people — most specifically, to South African youth: my words, my pictures and the moments of exchange I could document. It was a journey as much about the image as it was about learning, listening and teaching. Figure 5. Inside the Queens College Boys Hostel. Queenstown. 2014. 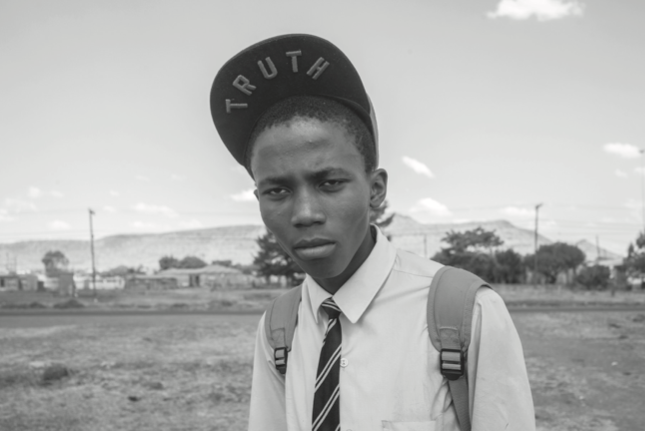 In the visual essay that follows, I document the lives of young people born in post-apartheid South Africa. I offer a panoramic view of the diverse individual experiences of those who have grown up in a multicultural country that must deal with the aftereffects of racial segregation and the control of capitalist economic ideologies. 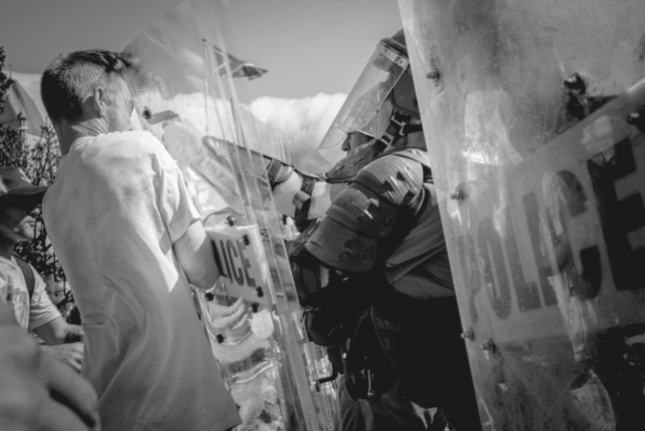 Many of these images, set against a backdrop of the 2015 student mobilizations, also demonstrate how Nelson Mandela’s cry for equality still rings loud. 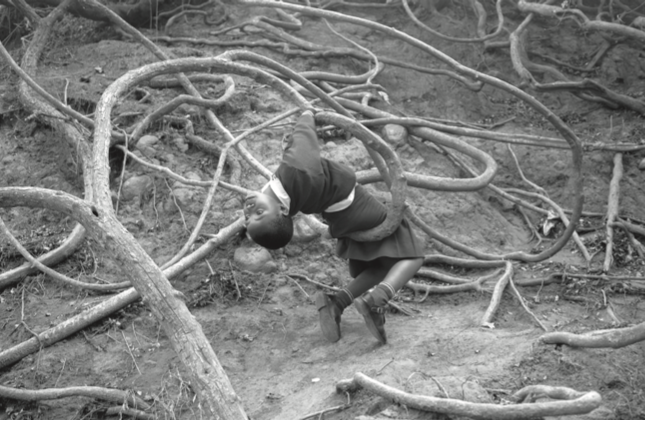 They are images of the present that seek to interrogate a lingering past. They are a reflection on the complex social dynamics that run through South Africa in a period known as postapartheid. Figure 7. A poor white family living in Coronation Park. Krugersdorp. 2014. Figure 8. With both parents disabled, this family survives with the support of a social grant. Kwa-Zulu- Natal. 2014. Figure 9. Samantha, 5, with her parents. Ermelo. 2014. Figure 10. 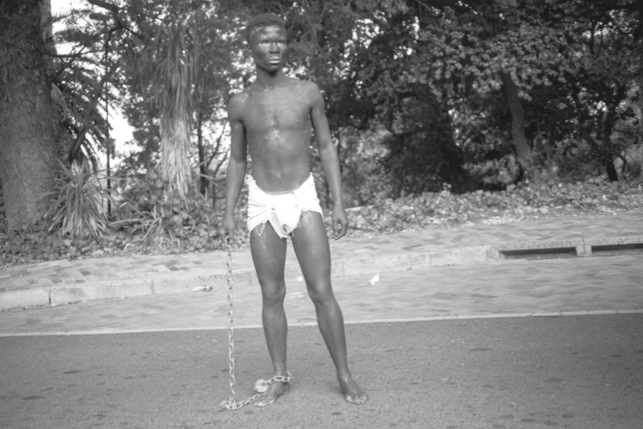 UCT student performs as a slave, providing charged commentary in response to the institutionalized racism at the University of Cape Town. 2015. Figure 11. Truth in Batshobela township. Bloemfontein. 2014. Figure 12. Young girl running in Qakwini Village. 2015. Figure 13. 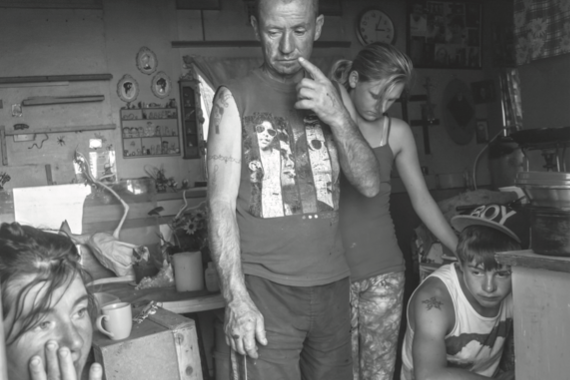 Like father, like son in Orania, an Afrikaner-only town. Freestate. 2014. Figure 14. 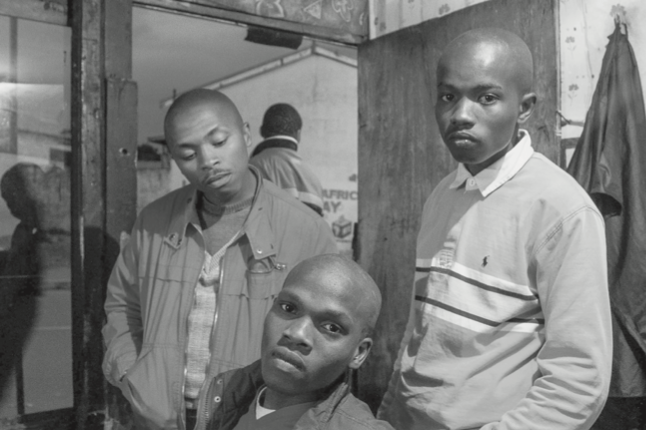 Akhona Godlo, Lwazi Pakade and Bubele Moodie at a barbershop. Langa township. 2013. Figure 15. Police point stun grenades at students who are demanding free education in front of the South African Parliament. Cape Town. 2015. Figure 16. 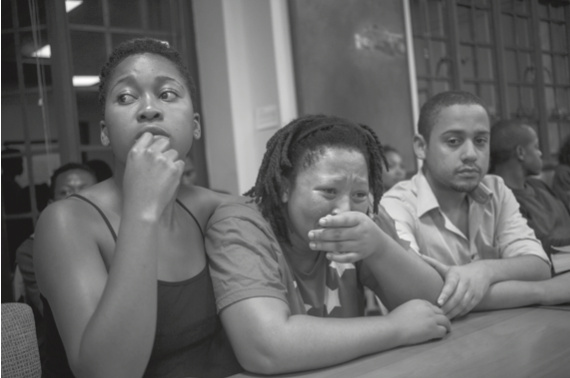 A UCT student cries while discussing patriarchy and the need to be heard. Cape Town. 2015. Figure 17. Students hang out during National Heritage Day in Johannesburg. 2014. Figure 18. The imagination tree. A young girl waits for school transport. Port St. Johns. 2014. Sipho Mpongo was born in 1993 in Nqamakwe, a rural village on the Eastern Cape of South Africa, just one year before the country celebrated its first universal elections, thereby marking an end to apartheid. Raised in the Langa Township of Cape Town, Mpongo is a photographer whose work examines youth culture and political change. He is a graduate of the Cape Town School of Photography, a recipient of the Magnum Foundation Human Rights and Photography Fellowship and a member of the photography collective Iliso Labantu. Mpongo’s photographic work has been showcased in national and international exhibitions and published in the New York Times Lens’ Blog, Burn Diary magazine, Huck magazine and by the Open Society Foundation. 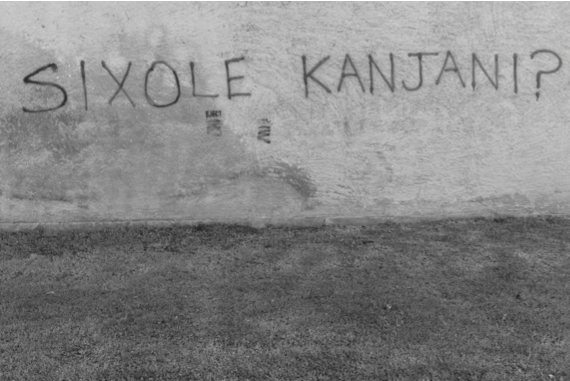 His essay, “Sikhulule-kile: We are Free,” which examines township life in postapartheid South Africa, was published in the book Township edited by Anne Rearick (2016, Galerie Clementine de la Feronniere). Excerpts from his “Born Free” series can be seen at www.twentyjourney.com. 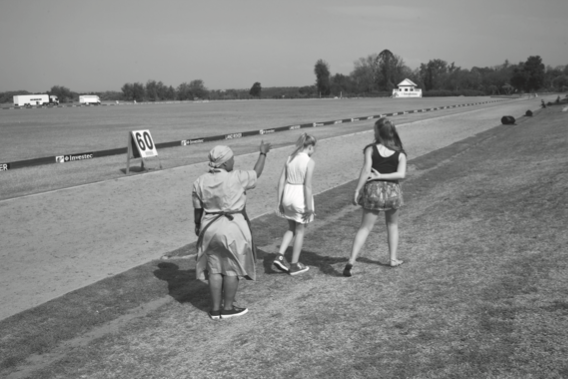 This entry was posted in Selected Print and tagged apartheid, Photo Essay, photography, South Africa, youth. This article is phenomenal, thought provoking and evocative. Your words really sing and your feelings come through with a truth that cuts through all the rubbish that is so often present in todays writing. Your photographs are simple but beautiful, each telling a story where words are unnecessary.